Readers of this blog are likely painfully aware that I am not a wordsmith. Some folks can make words dance on a page. They spin an eloquent yarn that has the ability to hypnotize the reader. That’s not me. I can, however, given enough time and luck, make a decent photograph. That’s the limit of my talent. 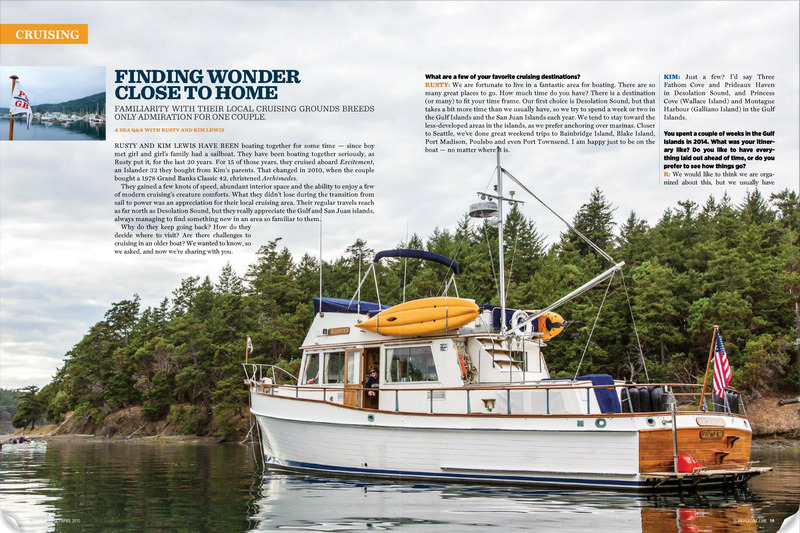 So I was surprised when the editor of Sea Magazine contacted us about doing an article for their magazine. He had found us through our little blog. 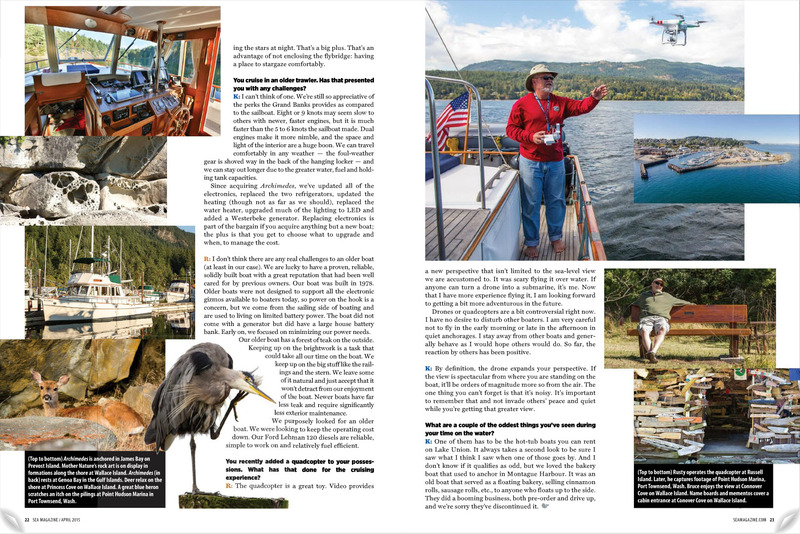 Mike Werling, editor of Sea Magazine, and I exchanged a few emails, Kim and I wrote up the article, and we provided a few photos. After a bit of back and forth, this is the result. Six pages. The April 2015 issue. I think it turned out great! And we are even the “feature” story. That’s even better. Thanks Mike. Click here to read the article online. Here’s a link to the online version of the story. 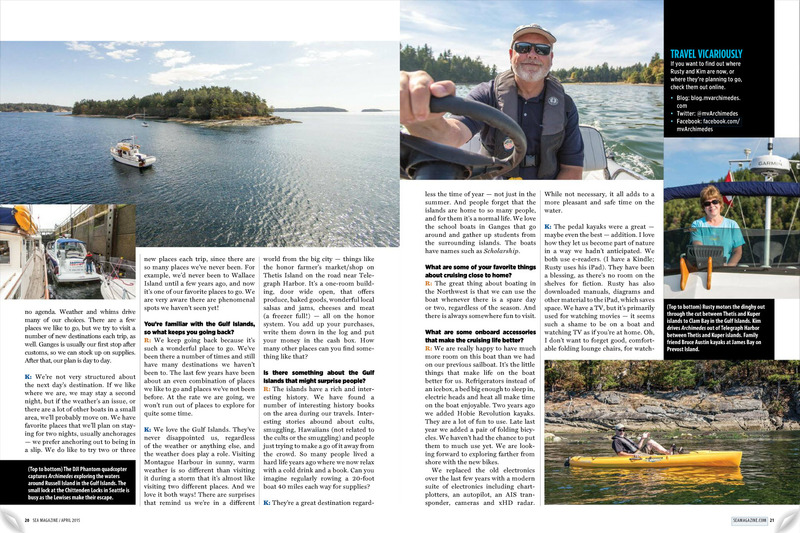 This entry was posted in Interesting and tagged Archimedes, boating, British Columbia, Grand Banks, Grand Banks 42, hobie, hobie kayak, hobie revolution 11, Montague Harbour, Poulsbo, Puget Sound, Salish Sea, San Juan Islands, Sea Magazine, Trawler, Wallace Island by Rusty. Bookmark the permalink.